What motivates individuals to protest children crossing the border, join an organized militia or embrace the notion taxes are a form of government extortion? What influences the perception affordable healthcare and living wages are handouts and climate change is a government hoax. Why is poverty perceived as shameful and self-inflicted and poor minorities as undeserving? Largely, this thinking is a consequence of a one-size-fits-all theory of government, predicated on false premises and conclusions. 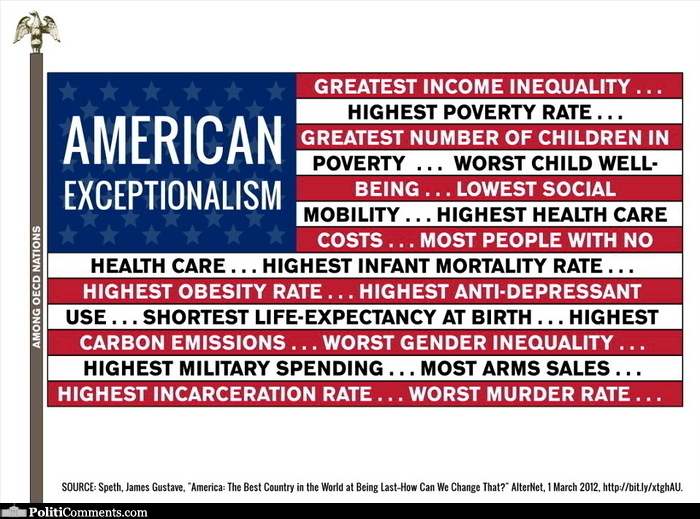 Wealth, equality, healthcare, immigration and climate change are complex issues conservatives routinely dismiss, precisely because they are so difficult to comprehend and results in an empathy gap that attracts extremist theories and an illusion of knowledge. 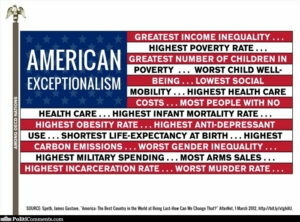 Conservatives blind faith to the myth of American exceptionalism further isolates their emotions and cocoons their perspectives, at the expense of compassion and a broader worldview. The real tragedy is these social Darwinist have been recruited as willful accomplices in their own emotional fraud. This masterful distraction of illusion has managed to convince conservatives the threat is at the front door disguised as an African American Socialist with Muslim ties to the White House when the real danger has been pilfering our rights, spilling our blood and squandering our treasure out the back door. The threat of the American corporatocracy has made a mockery of our ideals and somehow managed to convince conservatives that profits and shareholders should come before the common good and citizens. That corporate welfare, tax evasion and exorbitant executive salaries should come at the expense of labor, healthcare and hourly wages. When they finally do realize they have been sold-out and forced to dig their own graves by the very same group they have been protecting I’m curious if they will have the necessary self-awareness to comprehend their erroneous anger, their blind faith to the myth of American exceptionalism, the endless pursuit of wealth and a perpetual culture of war.